You must make reservations at least 5 minutes in advance of the time at Sazon. There is self- parking only, but most of the parking near the restaurant is metered. The meters have certain times when they are monitored and when they are not, so please read signs carefully. 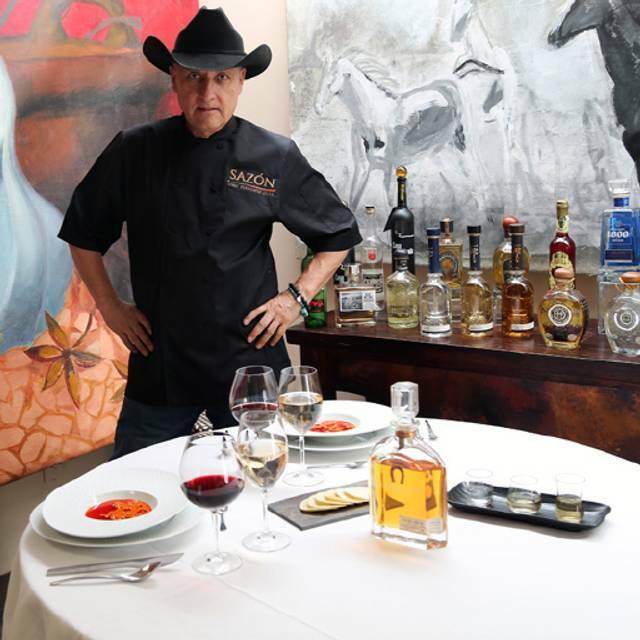 Originally from Mexico City, Chef Fernando Olea, formerly Chef of Epazote, has been enthralling diners in Santa Fe since 1991. Chef Olea creates sophisticated flavors using Old Mexico’s indigenous and culinary traditions alongside ingredients from around the world. His menu is deliberately small, featuring fresh and locally sourced produce and meats when possible. Nothing evokes the mystery of Mexican cuisine more than mole, a sauce of complex flavors that usually includes toasted and ground spices, seeds, nuts, chocolate and chile. Many mole recipes contain more than thirty ingredients and some recipes have five varieties of chile alone. Chef Olea is delighted to share his moles that include his "New Mexican Mole" that he created to commemorate Santa Fe’s 400 year anniversary in 2009. 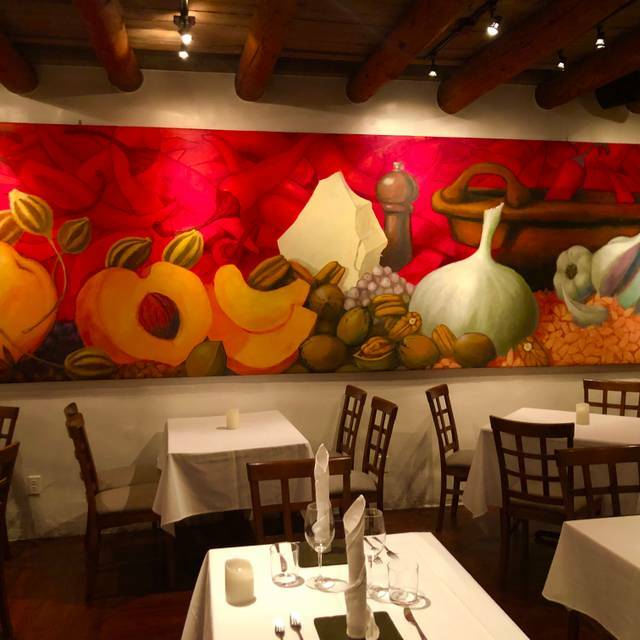 The large mural in the main dining room, was painted and presented to Chef Olea by Federico Leon De La Vega, a well- known artist from Mexico City. Amazing selection of unique SW cuisine. Home-made mole selections and recommended pairings are a real treat. The mole ice cream is an amazing creation! Our server Candice was very knowledgeable of the menu and food/wine pairings and she ensured we had a wonderful birthday celebration. Highly recommend Sazon. Amazing flavours, Chef Olea has created another exceptional dining experience! Best birthday meal in New Mexico! We celebrated our 29th anniversary at Sazon. Everything about our evening was special, and the food was so perfectly conceived and delivered. Food was unique and perfect. Loved the ambience, staff, level of creativity. Chef was present and the sweetest soul. Dined with wife and teenage son and felt extremely well taken care of....highest of recommendations for Sazon. While Santa Fe is full of fabulous fine dining experiences, Sazón provides a Mexico City evening, graced by engaging waitstaff, scintillating cocktails, and creative, palate-energizing tastes from a perfectly grilled octopus bedded in crushed tomatoes and capers, to nuanced grilled meat or fish with molés specifically created to provide maximum flavor to the protein. We didn’t have room for dessert but witnessed a deleted frothy berry dessert and a smoked ice cream being enjoyed by a neighboring table. 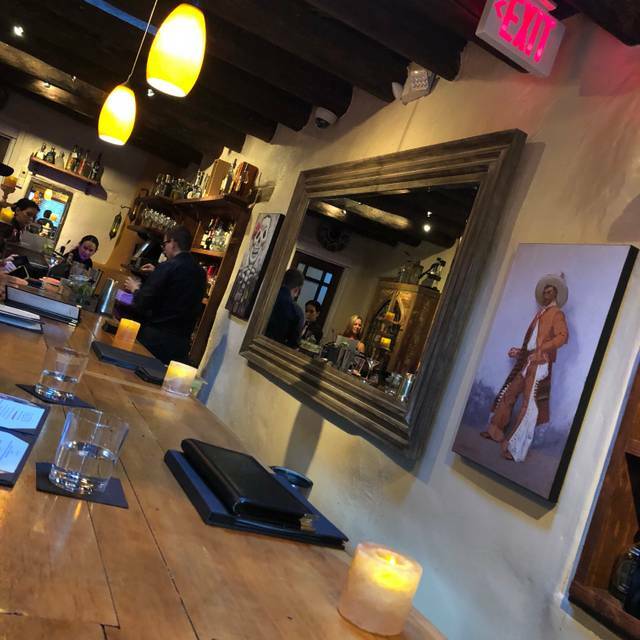 This is a unique experience to northern New Mexico, and not to be missed if you are a foodie! Amazing upscale Mexican food. Mole and dessert were amazing! Will return next time we are in Santa Fe! Every single thing about this meal was extraordinary - from the minute we sat down until we left entirely satiated the mood, the service and the food was perfect. Sazon is a not-to-be-missed dining experience. 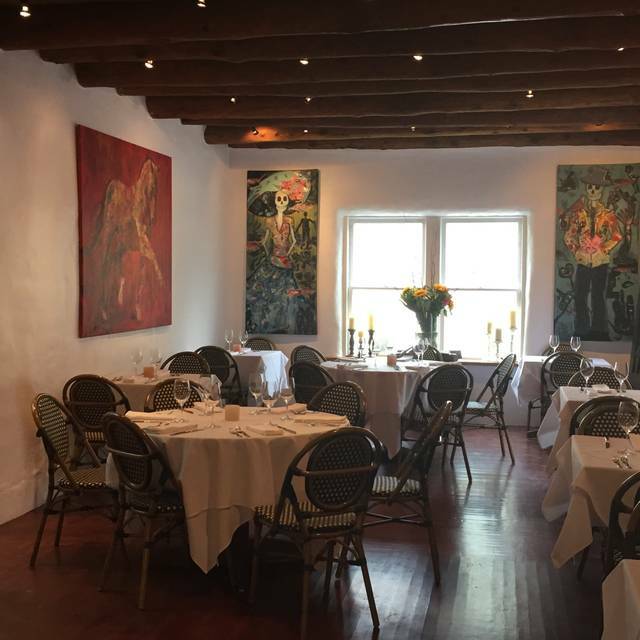 If you like mole, Sazon will become your favorite restaurant in Santa Fe. Everything was fabulous---food, service, ambiance. And the mescal flights are fun. Sazon did not live up to the hype or other posted reviews. 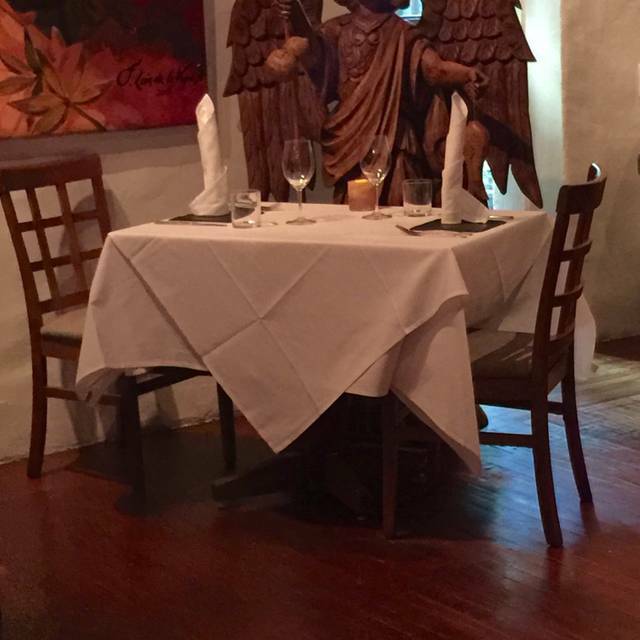 We love fine dining and frequent many such restaurants here in Santa Fe. Our experience may have been tainted by several large groups that were seated around us. The food is good, but the service is overly pretentious while lacking in execution. It appears that the chef is more interested in being the show and “touching “ all the tables several times a night than overseeing the kitchen staff. The noise level is at such an elevated level that my wife and I found that we were forced to yell just to carry on a minimal conversation. Fantastic evening. Exceptional dining experience. We were pleasantly surprised by the quality of the food and the flavors. Our waitress was very knowledgeable of the menu and walked us over the different types of moles used. Simply the best in New Mexico let alone Santa Fe. The best staff always knowledgeable aboiut the food and wine and the food is always great. We were celebrating my husband's 70th birthday, and Sazon was the perfect restaurant. A lovely card was placed on our intimate table, and everyone wished him well ... including the chef! They brought him a chocolate lava cake for dessert ... which was delightful. Thank You Sazon for making his special day even more memorable! The decor is great and the service was nice but the food was A LOT more spicy than they had communicated! Waiter was awesome - walked us through the history and processing of tequila, made great recommendations for a tequila tasting. Food was outstanding. Very unique dishes, all extremely tasty. The only negative was the octopus was a little chewy, but I didn't even care because the sauce it was in was so good! Probably the best meal I've had in Santa Fe. Ever. By far. Pricey, but excellent. Yummy! Delightful staff and wonderful space. Did I mention Yummy! If you are in Santa Fe this place is a must! One of the best meals of our lives served impeccably by Diego. An unusual and exciting mix of flavors, from the salad to soup to entree and dessert. Cannot recommend it highly enough. The atmosphere was quiet, quaint, and romantic. Perfect for a first date. The cuisine was incredible. Appetizers, the main dish, and dessert all complemented each other greatly, it was one of the best meals I've ever had! The staff was very professional and hands on. The Manager was the highlight. He really was hospitable and friends. It made for the perfect evening. I will definitely be back again soon! Appreciation for the high cuisine of Mexico has not much advanced since Diana Kennedy's pathbreaking popular cookbooks of almost 50 years ago. But at Sazón, under Chef Fernando Olea's supervision, one can experience these delights first hand and leave in a revery of discovery. Many of his ingredients are imported fresh from areas of Mexico to which they are native, such as huitlacoche, as delicate and ethereal as truffles, and the ingredients for his amazing moles, which are presented in an array of five types as an amuse-bouche upon your arrival. A connoisseur's collection of tequilas and mescals are always available for those fond of these Mexican elixirs. 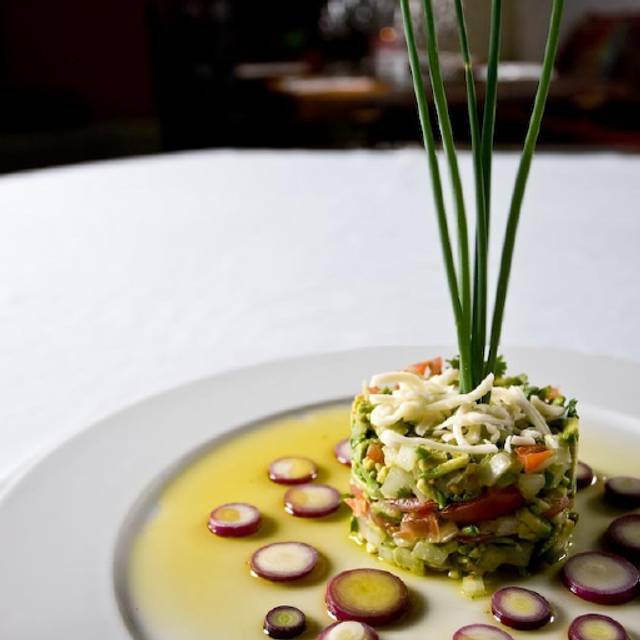 Dining at Sazón is a treat long to be savored. Excellent meal Wonderful ambience and service. We were very impressed with the food and service. A must for anyone staying inSanta Fe. The only problem we had was the incredibly high markup on the bottle of Pinot Noir we had which was excellent, but we paid $70 for a bottle and then found the exact wine in the local supermarket for $21.99 - and then we got a 10% discount. Don’t know how restaurants can justify this!!! 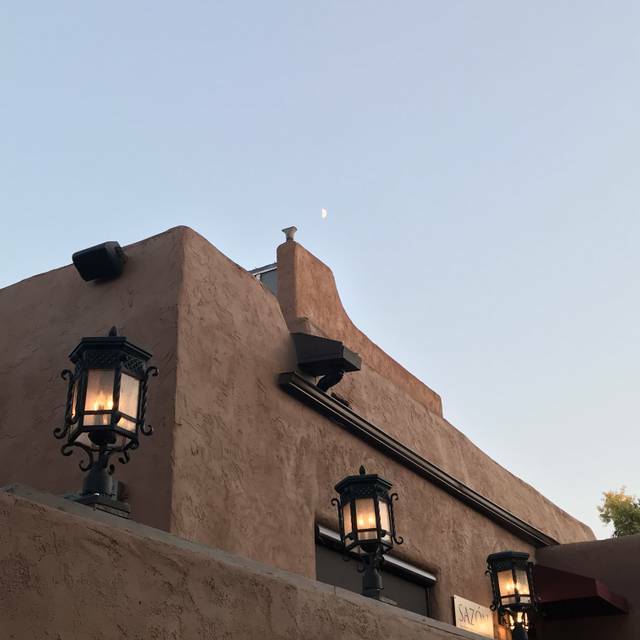 This was the best meal that we had in Santa Fe— a creative menu perfectly executed. The service was attentive and the setting was enhanced by beautiful original artwork. 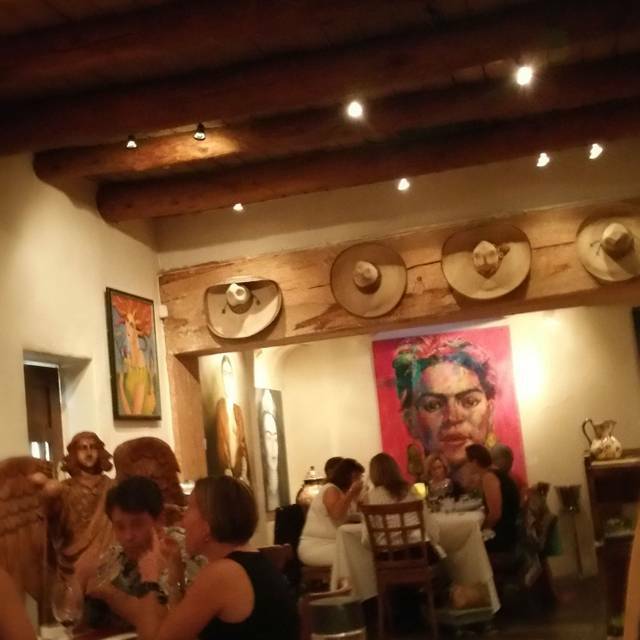 This will definitely be on our list of restaurants for our next trip to Santa Fe. I enjoyed Sazon. I would go back. There is, however, a lot of competition for you dining dollars in Santa Fe. Everything was good, maybe not great. It is an attractive dining establishment, the food was very good but a bit fussy. It is also expensive for what you get. I am fortunate in that I don't have to budget for meals but if you do there may be options that give a alternative dining experience that you may find suitable. First of all I should say we don’t love “fine dining” experiences because we find that they can be stuffy and the service can be overbearing. I also prefer a more rustic playing style as opposed to the sauces and artistry, etc. if you are into fine dining you would definitely prefer it to our experience. Overall we didn’t have a great experience. It was my birthday dinner and when we arrived they had a “happy anniversary” card on the table. There were only 3-4 vegetarian options on the menu which was stressful for a member of our party and put a not great mood on the whole occasion. We also didn’t love our server - I think again if you liked fine dining experiences you might have enjoyed it. We almost felt like we were in a SNL skit (or Portlandia) with her descriptions and service. But again this was the experience we had - I do think it depends on which server you end up with. Edited comments: to anyone who saw my comments on Open Table Points being denied - I contacted Open Table who responded within 24 hours and not only gave back my points but added 500 for the treatment I received. This is very good service - also said the would follow up with the restaurant. My remaining comments as follows stand: The service was very slow and except for the beginning mole samples given to everyone, it took an hour for our first course. The synchronized service is pretentious and just more timely regular service would be better. 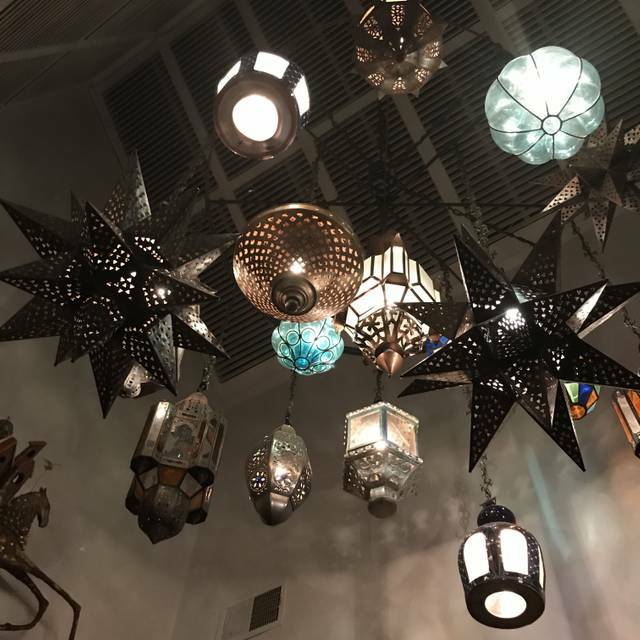 The ambiance is wonderful and the food was good, but after anticipating a fabulous evening, it was underwhelming and the points denial was embarrassing. I still plan to follow up with Sazon, as no gesture of goodwill was made over the points denial and the manager walked by several times all evening and never acknowledged us. I work in hospitality and no one should be left without some kind of acceptable acknowledgement or resolution. We chose Sazon for a birthday celebration and it was a very good choice. A very pleasant experience all round. Best place in Santa Fe for Mexican/New Mexican dishes, and perhaps best restaurant in Santa Fe today. The various moles are exceptionally good; unequaled in my experience, in Santa Fe or elsewhere. Service can be a bit disorganized at busy times. Tequilas and especially mezcales are outstanding. Good and service were excellent. It is not cheap.